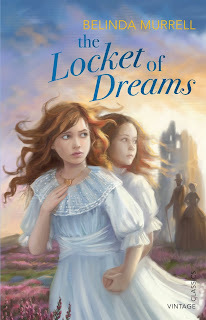 When I was offered a review copy of The Locket of Dreams, by Belinda Murrell (originally published in 2009 by Random House Australia, reissued there in 2013, and coming to the US in January of 2014, for ages 10-11ish), I was delighted to accept. How could I say no to the story of a magical locket taking Sophie, a modern Australian girl, back in to the life of the 19th-century Scottish girl who was her ancestor, Charlotte? I love a nice girl-centered historical Scottish time travel. And indeed, The Locket of Dreams is one I would have loved as a child--I would have read it in a day, transported, along with Sophie, to what was, at first, the happy, privileged childhood Charlotte and her little sister enjoyed on her family's estate in Scotland...and my heart would have ached when Charlotte's parents tragically died, and the greedy uncle and aunt moved in. And though, as an adult, this was somewhat familiar fictional ground, and did not thrill me as much as it would have back in the day, I thoroughly enjoyed the journey of the two girls to Australia, and their exploration of their new home (not having read much set in 19th-century Australia, this was fresh ground for me, and I cannot in any way speak to the accuracy of its portrayal of time and place). I do think, though, that this is one best read by a younger reader who enjoys somewhat romanticized historical fiction (hard issues of class and race are glossed over, although the plight of the Scottish tenant farmers under the rule of the new uncle is a concern). Sophie is primarily an observer, rarely doing anything of substance in the past, and so the most intellectually engaging part of time travelling, the intersections of past and present, aren't there. It's never desperately clear that her experiences in the past are changing Sophie, and so she can't help but come across as a bit of a Device. Because of this, it lacks any emotional punch in the gut--one feels sadness for Charlotte's situation, but the story as a whole is not desperately Powerful, the way the best time travel books are. Still, it's a pleasantly written book, full of vivid description, and Charlotte's an appealing character with whom many girls (and possibly some boys) will empathize. This a good one for the reader who doesn't like Dramatic Adventure; the few bits of Adventure seemed tacked on to the story, and not organic to it. And there are lots of nice animal bits (horses, a dog, assorted Australian fauna), that will add to its appeal for those who love animals. Short answer: I was happy to read it, but would like to give it to ten-year-old me. I realize this isn't neccessrily helpful, but I think the cover shown above is also useful--if a potential reader loves the cover, they'll love the book. I agree with Jenny's comment.